I’ll admit these images are not white balanced, but the “new” quagga is not a dull grey, but a boney golden brown. The difference is that she has been cleaned of dust and dirt. 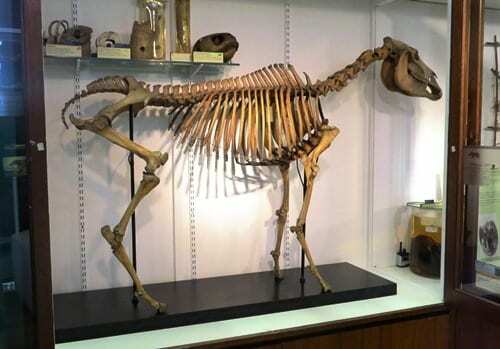 Unlike many of the specimens in Bone Idols, the quagga has been in a case for as long as we can tell. 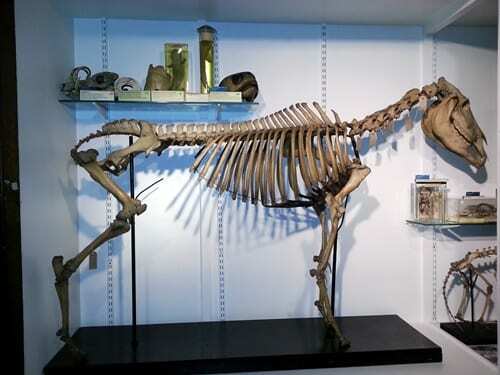 We believe she arrived at the Museum, with the rhino in 1911 from the “University of London Loan Collection” and we don’t know any history before that, but given that they went extinct in 1883 the skeleton is at least 30 years older than that. Nevertheless, the museum was lit with oil lamps for a long time, and the cases aren’t airtight. It is slightly shocking to see how dirty specimens can still get inside their cases. 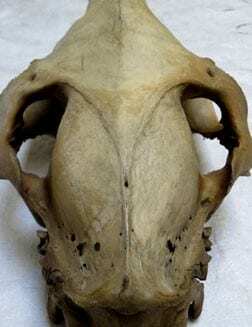 The quagga’s skull half cleaned. The quagga’s atlas half cleaned. Take a look at those top pictures – the “before” skeleton’s sternum (breast plate) is black, the “after” is not. This part of the skeleton is made of a lot of cartilage which is often removed when the skeleton is being prepared from the carcass. This didn’t happen with the quagga and it had been oozing a horrid black sticky substance for as long as I’ve worked here. This has been removed to reveal the clean cartilage below. At some point in the skeleton’s life-after-death it was remounted (before this project). The metal upright that supports its back end was moved towards the tail. 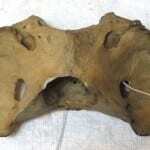 These uprights are supposed to be fixed to the skeleton with pins that run down into the pole from the pelvis. Whenever this adjustment took place they moved the pole but not the pin, so it was just resting, metal on bone, on the sacral vertebrae. Not only is that obviously bad, but it was too far back to take the weight of the spine, which eventually sagged at an angle where the last lumbar vertebra met the spine, with the wires between the two being dangerously pulled. You can spot that we’ve moved the rear support forward under the pelvis again, but there is still a dip in the spine. This is deliberate. Zebras (indeed all horsey things) have a natural curve to the spine. Our quagga has a metal rod running through the vertebrae from the pelvis to the skull. Previously it was dead straight, but it was completely removed, cleaned of corrosion, given the curve, and then threaded back on. Now our quagga is supported and correctly curvy. The newly positioned head, on the newly up-righted neck. 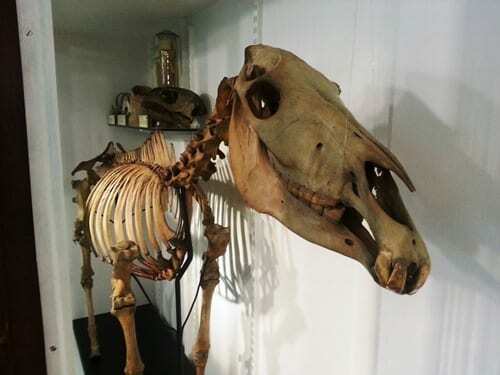 Despite having worked with this specimen, the most important in the Museum, for over ten years, I never noticed that its neck was on upside down. This has been rectified. Her head has also been supported in a more horizontal position, which is much more anatomically correct. 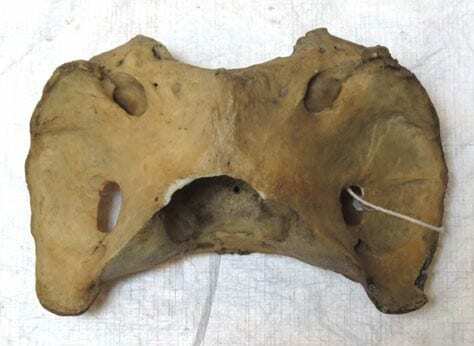 Not much has been done to the front legs, but the back leg (the fourth leg is long missing) was previously so out of position that it couldn’t meet up with the socket in the pelvis. The supports have been altered so that it does, and the skeleton is no longer doing some kind of backwards-reaching ballet pose. As part of this project we have been given the oppportunity to CT-scan the quagga’s existing right hind leg. The hope is that we can then “mirror” this data, and then 3D print a left hind leg. The scan is happening next month, but we remain cautious as there is so much metal in the leg, which cannot be removed, and this may ruin the scan. Watch this space. There are many other less noticeable improvements which have been made, all increasing the length of time this invaluable specimen can be enjoyed and used by our visitors, students and researchers. Points to you if you can spot them. 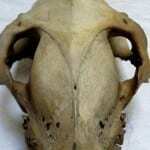 There are still many specimens to be treated as part of the Bone Idols project. You can read all about it on the website, which is also where you can donate to support this crucial work. Thanks so much to those that have donated to make the quagga’s work happen, and thanks to those that donate to our remaining works.